Takeaway: For structural components exposed to fatigue conditions, designers must be concerned with both the strength and the toughness. Strength is a measure of the stress that a crack-free metal can bear before deforming or breaking under a single applied load. Fracture toughness is a measure of the amount of energy required to fracture a material that contains a crack. The tougher the material, the more energy required to cause a crack to grow to fracture. 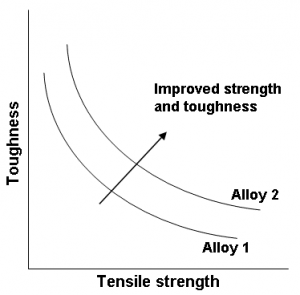 For a particular alloy, lower fracture toughness corresponds to less ductility. For example, glass has very low toughness and is very brittle. For a component with a crack of a particular length, as the fracture toughness decreases, there is a decrease in the component’s ability to withstand its load before fracturing. Conversely, for a certain load, as the fracture toughness increases, a component can tolerate a longer crack before fracturing. As shown in the figure below, for any particular alloy, the toughness decreases as the tensile strength increases. (For further reading, see An In-Depth Look at Tensile Strength.) Consequently, when high toughness and high strength are both required, it is often necessary to change from one alloy to a different alloy that satisfies both requirements. Designers are often tempted to use a material that is as strong as possible to enable them to minimize component cross-section. However, this can inadvertently lead to using a material with insufficient fracture toughness to withstand fracturing if a small crack forms in the material during component manufacturing or during use. Fatigue stress is one possible cause of cracks. For structural components exposed to fatigue conditions, designers must be concerned with both the strength and the toughness. The strength must be large enough that the material can withstand the applied loads without deforming. The toughness must be sufficient for the metal to withstand the formation of fatigue cracks without failing catastrophically. More information about the relationship between strength, toughness and fracture behavior is in Deformation and Fracture Mechanics of Engineering Materials by R.W. Hertzberg. The article and images previously appeared at https://www.imetllc.com/training-article/strength-toughness/. Reprinted with permission. Copyright Industrial Metallurgists, LLC.